The Profit Point Tax team has well over 70 years of federal tax planning experience. We have advised small corporations, pass-through entities, and Fortune 500 Companies across diverse industries. Our planning and advisory work includes domestic and international tax issues and the structuring of complex business transactions. We also have a wealth of expertise interfacing with the Internal Revenue Service in the context of IRS audits and hearings before the IRS Appeals Division, and have achieved successful outcomes for clients in tax matters large and small. In the aggregate, we have successfully defended proposed IRS tax adjustments well in excess of one billion dollars. Before making your next tax-sensitive business decision or engaging in discussions with the Internal Revenue Service, contact Profit Point Tax. Our expertise and creativity will add value to your business. 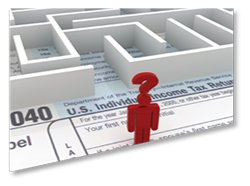 Contact Patrick Sweet (patrick@profitpointtax.com), if you would like a free consultation regarding your federal tax issues.